Dalvin Cook was one of five Vikings to not practice Wednesday, including defensive end Everson Griffen (knee), tight end David Morgan (knee), right tackle Rashod Hill (ankle) and punt returner Marcus Sherels (ribs). 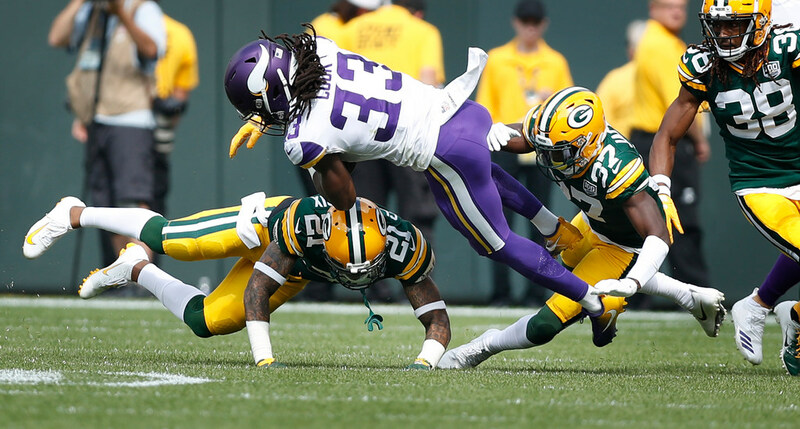 Even though running back Dalvin Cook donned a helmet and went through warmups with his teammates during the start of Wednesday’s practice, the Vikings ultimately held him out after suffering a hamstring injury on Sunday in Green Bay. Cook was one of five Vikings to not practice Wednesday, including defensive end Everson Griffen (knee), tight end David Morgan (knee), right tackle Rashod Hill (ankle) and punt returner Marcus Sherels (ribs). We’ll get more clarity on Cook’s status for Sunday against the Bills depending on his level of participation during practices on Thursday and Friday. Cook had said after Sunday’s game in Green Bay that he was just dealing with fatigue and cramps, but obviously there’s more to the hamstring injury that knocked him from the end of overtime against the Packers. The good news is center Pat Elflein (ankle/shoulder) was a full participant in Wednesday’s practice for the first time since returning to the field from his lingering ailments. He was limited in all practices prior to games in Week 1 and Week 2. While Elflein could be on track to make his season debut on Sunday against the Bills, the Vikings also have to keep in mind the quick turnaround into a Thursday night game in Los Angeles against a high-powered Rams defense next week.